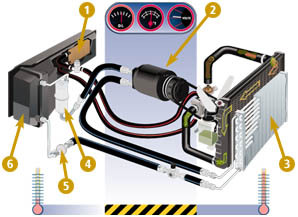 Your car's engine is the power source for both the heating and air conditioning systems. The systems also share other components, as the diagram below shows. Here's what happens when you flip on the heat or the air conditioner. Heat is a byproduct of the engine's combustion process. The heat is absorbed by the coolant in your car's radiator. The coolant is then circulated through the heater core before returning to the radiator. The heating system also includes a series of air ducts, a blower motor and fan, and temperature and duct controls, which selct the desired temperature and direct the flow of warm air. As the refrigerant flows through the condensor, it gives up heat and converts from gas to liquid.